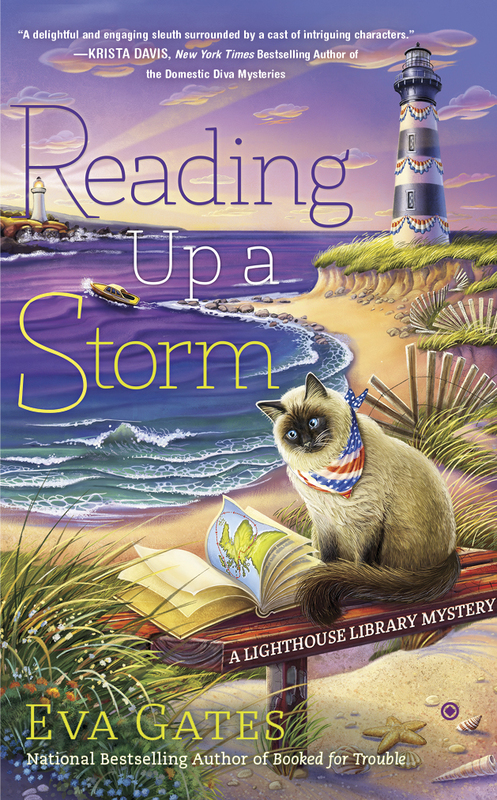 By Lucy Richardson, from the Lighthouse Library series by Eva Gates. I don’t know if anyone else has noticed but our Teddy appears to be smitten by Julia Ruddle. When I say smitten I mean totally heads over heels crazy for. That would be Theodore Kowalski, faithful patron of the Bodie Island Lighthouse Library, impoverished rare book dealer, and well-known eccentric. And that would be Julia Ruddle, New York City native, granddaughter of wealthy businessman Jay Ruddle, heir to the furniture empire fortune. Julia seems rather fond of Teddy, which is good, I guess. Except for the third leg in their little triangle. Greg. Handsome, charming, sophisticated: everything poor Teddy is not. Greg’s the curator of Jay Ruddle’s private, and very extensive, collection of historical documents mostly from the age of sail, and the group is here, at our little library, opening discussions on possibly donating the Ruddle collection to the library. Wouldn’t that be a coup! I’ve never seen Bertie – the library director – so excited. I fear that poor Teddy is going to have his heart broken. Or worse, if Julia is found guilty of murder and sent to prison. 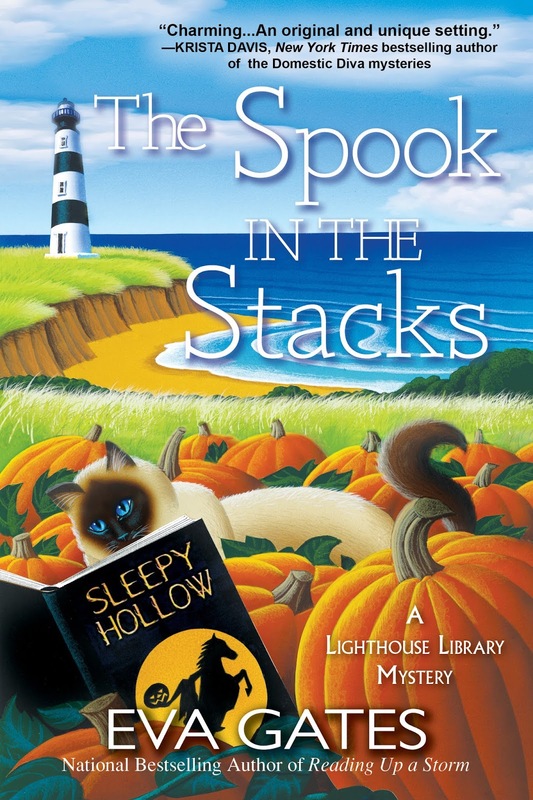 Find out if Teddy is able to save Julia from prison and win her heart in the fourth Lighthouse Library book, The Spook in the Stacks. As part of the Killer Characters Cozy Up To Summer giveaway, Eva is giving one lucky commentator a hardcover copy of The Spook in the Stacks! Please leave a comment to enter. Contest closes Thursday August 2. US and Canada entries. 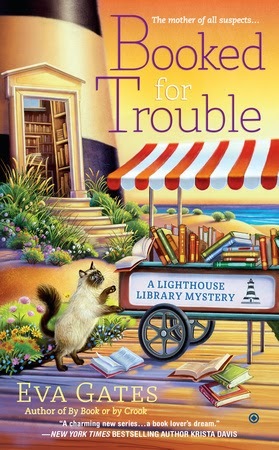 I have only read the first book in this series, but I just love the quirkiness of the Lighthouse Library. I worked at our local small town library for 13 years. An ardent traveller, every place I go I'm curious about the library there, even if I only get to see it from the outside. I would love to win a copy of the newest book in this series. Libraries really are the center of the community, aren't they? Looking forward to reading the newest book in the series. I love lighthouses and look forward to reading this one. I love this series, but I'm still on the waiting list at my library for it. I hope Teddy gets his girl! I own the three books shown above and have enjoyed them all immensely. I would jump for joy if I won the first hard cover book in the series. It would have pride of place on my bookshelves. This is one great series. I always get a copy as soon as they come out. Aah, a kind-of love triangle - and murder! Love that cover. Our county includes a lot of cities and each has a small branch of the library. The one closest to me is at the community center, along with the water park, local office of our state rep, food trucks on Thursdays . . . what would we do without the library? I current have 2 books checked out and 1 waiting for pick up. What would we do without the library indeed! I have read the first three books in this series and I really loved the series. 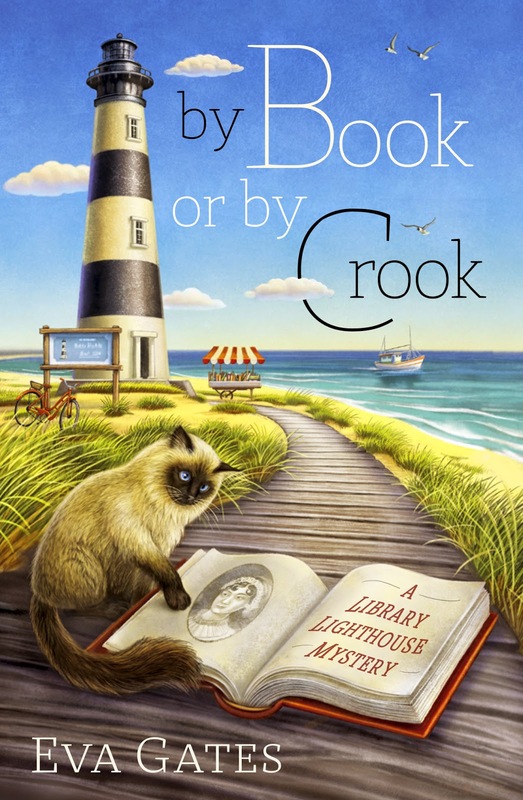 What better setting than a lighthouse library in the Outer Banks. Can't wait to read "The Spook in the Stacks". Can't wait to read the book. Thank you for the giveaway! I can't help but love Teddy. And I'm also jealous that Lucy lives & works in a library in a lighthouse. I have this series on my wish list TBR. This sounds so good. I really hope Teddy gets his girl. Thanks for the chance. Sounds like another good book in this series. I love the cover, too. I have enjoyed this series and my fingers are crossed my name is chosen. Great story. Thanks for telling us. THis is such a great series and can't wait for this installment! Congratulations, Ashley. You win! I've send you an email - please respond with your postal address. Thanks for entering everyone. This sounds great...I would root for Teddy. Thank you for the chance. Love this series and lighthouses. I grew up in Duluth MN listening to the foghorns from Split Rock Lighthouse. Slowly making my way through the second book in the series, which I love. My best job ever was working in a library. What's better than mysteries and libraries? Thank you! I love winning & passing it on. After all sharing is caring. As a Lighthouse lover!!! I so love this series. Have read all but this last one. Thanks for the chance! I really enjoy this series so much. I can’t wait to read the newest one, what a neat cover and title.the spook in the stacks! Thank you for writing it.